At least once a month, inspect your tyres closely for signs of tyre damage such as cuts or punctures as well as uneven or excessive wear. When inspecting your tyres, you should also look for any stones, bits of glass, metal, or other foreign objects in the tread or sidewall. These may work deeper into the tyre and cause air loss. If any tyre continually needs more air, have your Westlake Tyres dealer check to find out why it is leaking. Damage to the tyre, wheel, or valve may be the problem. 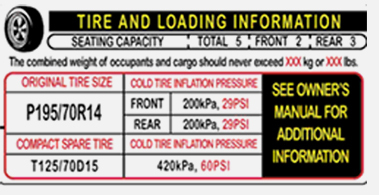 Maintaining correct tyre inflation pressure helps optimize tyre performance and fuel economy. 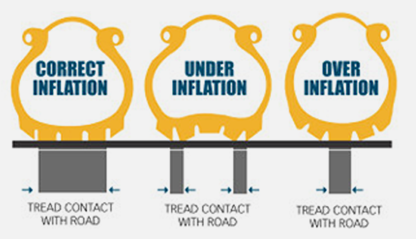 Correct tyre inflation pressure allows drivers to experience tyre comfort, durability and performance designed to match the needs of their vehicles. Tyre deflection (the tread and sidewall flexing where the tread comes into contact with the road) will remain as originally designed and excessive sidewall flexing and tread squirm will be avoided. Heat build-up will be managed and rolling resistance will be appropriate. Proper tyre inflation pressure also stabilizes the tyre’s structure, blending the tyre’s responsiveness, traction and handling. The tyre label located on the driver’s side of the center pillar outer panel gives the original tyre size, cold tyre pressures recommended for your vehicle, the number of people that can be in your vehicle and vehicle capacity weight. Maximum number of vehicle occupants, including the driver. Is the maximum total weight limit specified of the load (passengers and cargo) for the vehicle. This is the maximum weight of passengers and cargo that can be loaded into the vehicle. Size of tyres mounted at the factory.